It is important that you are able to get to orientation on time in order to receive full credit for attending. Please ensure that you have adequate transportation to and from campus for orientation. Major construction projects in our residence halls will affect how and where orientation participants will be able to park. We strongly recommend carpooling or using alternative transportation options to get to campus for orientation. Please read about all of our parking and transportation options below. Information regarding parking will be sent to you soon after you submit your registration for orientation. If you do not receive information before your session, you may park in designated area (see map) and ask for instructions at check-in. New Student Orientation cannot forgive or pay any parking tickets issued during orientation. Carpooling is a great transportation option because it helps the environment, saves you money, and alleviates parking shortages at the same time! Taking just one vehicle to campus reduces the amount of gas needed to get to campus. If your parents or other family members will be attending the Family Connection, leave the keys with them so that they can leave campus when their program concludes at 5:00 pm on day one. Since students are required to stay overnight in the residence halls, you will not need access to your car during the program. If you are flying into Albuquerque International Airport, shuttles, taxis and rental cars are available at the airport. Should you need to drive in from the airport go north on Yale Boulevard 2-3 miles. Turn west (left) on Redondo Road and then follow the campus map once on campus. Make appropriate travel plans to ensure that you arrive on time for your session. Many of ABQ Ride's routes service the UNM campus. 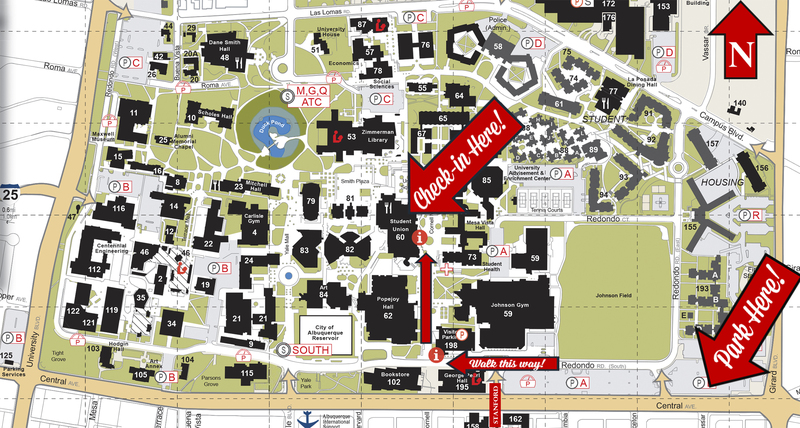 Our check-in area is located at Hokona Hall (Building #58 on the Campus Map). A major bus stop is located on on Lomas Blvd at UNM Hospital within close proximity to Hokona Hall. For more information about taking the bus to UNM Hospital, visit the ABQ Ride website, call 505-243-RIDE (7433). The New Mexico Rail Runner provides passenger rail service from Santa Fe to Belen with a major stop at the Albuquerque Downtown Depot. For information about train schedules, routes, and fares, visit the Rail Runner website or call 1-866-795-RAIL (7245). The Transportation Information Center (TIC) is located on the bottom floor of the SUB in front of Nusenda Credit Union near the Mercado and Lobo Card Office. At the TIC you can work one-on-one with a friendly and knowledgeable representative to explore all of the transportation options available to you here at UNM. The TIC serves as a resource to new students and parents with questions or who need help with ABQRide/NM Railrunner routes and schedule information. Open Monday Through Friday, 8:30 a.m. to 3 p.m. Please do not make travel plans until your orientation reservation is confirmed. New Student Orientation is not liable for non-refundable travel costs.